In a lovely conversation with my niece (who is studying Political Science at a prestigious US university), she said that she admired professors for all the writing and multitasking that we do (teaching, research, service to the university, to their own disciplines, and that she was impressed that I wake up at 4 in the morning to write, every day. I explained to her that I had to become more disciplined because I have so many broad research interests, and activities outside of academia, that I needed to make sure I budgeted time in my schedule for everything I need to do. I’m a pre-tenure professor in a competitive, R1-like university institution, so I *have* to publish and I *have* to write a lot, and write solid pieces. I learned that I needed to protect my writing time. Last year, I didn’t do #AcWriMo, the month-long challenge issued by Dr. Charlotte Frost (from PhD2Published fame) to all academics. Dr. Frost suggested that, following the model of the #NaNoWriMo (National Novel Writing Month), one could use November to binge-write and achieve completion of a major piece. Personally, I love the idea, but this year I am not planning to do it either. I am going to a conference in early November, I’m finishing an applied research project report and my Mom is getting major surgery, so I’m going to be busy with taking care of her while she is at the hospital. AND I was invited by two prestigious institutions to go present a seminar in November. Plus, I’m teaching two undergraduate courses, and organizing a research workshop around the climate change policy evaluation project I’m leading. So, overall, November is a BAD, BAD month for me to binge-write. 1. Use #AcWriMo to force you to write EVERY DAY. I read somewhere that discipline creates habits, and that 21 days of repetition of a pattern related to a single habit could also form a new habit. I find that this 21 day idea works in my case, and it usually takes me about 3 weeks to get back into my usual routines when they’re majorly disrupted (for example, when my parents were very ill, it took me a solid 3 weeks to go back to the gym on an every day basis). You could, potentially, use #AcWriMo to get you into the discipline of writing every day, for periods ranging from 30 minutes to 2 hours. You don’t have to binge-write for long hours, all you need to do is to build a new routine and create a new habit of writing every day. And maybe that way, you will be able to #GetYourManuscriptOut by the end of November! 2. Use #AcWriMo to help you shape a major piece of work. Again, using the 21 days’ repetition technique, you could set your goal to be shaping a new major piece of work. By the end of #AcWriMo, you could report the progress you have made on said major piece. 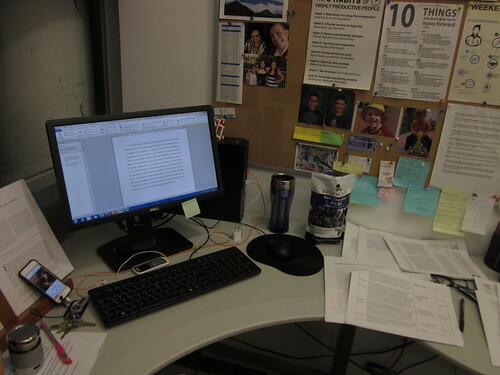 One of the great things about #AcWriMo is that it’s a month-long challenge. Four weeks is perfectly enough time to rethink a major piece of work, or to draft a skeleton of a new book, or to think about a large grant proposal. Maybe you can map out a new project. Or design a fieldwork research strategy for when you actually go out on the field. As long as, by the end of November, you have something to show for your efforts, you’ll be golden. 3. 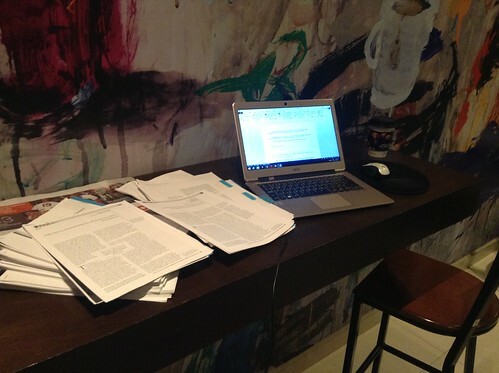 Use #AcWriMo to get you out of a rut. One of the challenges that my students and colleagues have told me they face is anxiety about their writing. They feel it’s not good enough (ah, imposter syndrome, you do work in mysterious ways). They feel that they can’t afford to write (though as I have advocated, even 15 minutes on a daily basis can help). So you could use #AcWriMo to rethink how you approach your writing. If you feel like you need to procrastinate, here are my 7 ways in which you can make your procrastination more productive for your academic work. If you feel that your writing is stuck, here are my 5 ways in which you can get your academic writing unstuck. You feel like you have no way to start writing? 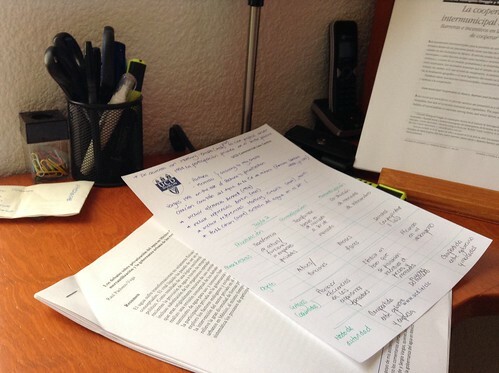 Here are some ideas to kickstart your academic prose. The idea here is… DON’T STOP. Just keep going. You can move forward at whatever pace you set forth for yourself (because not everyone works at fast speeds), but you are always moving forward. That’s the idea… use #AcWriMo to change the course of your academic writing. I do look forward to hearing from my readers on how #AcWriMo goes for them. In the mean time… back to writing for me! Tagged with academia, academic writing, AcWriMo, binge writing, discipline, writing every day.